This topic will explain the additional changes you can make to any of your integrations after configuration. If you still need to set up an integration with a third-party vendor, see the Integration Configuration page. This screenshot shows an integration with PagerDuty and its accounts as an example. Toggle switch to enable or disable the account. Hovering over the numbers of each account shows a status summary of the account. Indicates that the required fields for that account have not been completed. 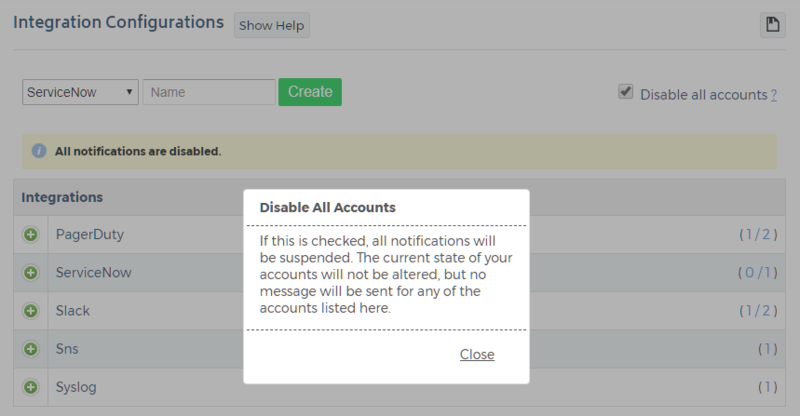 When you select the Disable all accounts option on the Integration Configurations page, you disable all notifications for all the accounts in your integrations. This option does not disconnect or delete anything: it simply acts as a pause button until you re-enable the notifications.